Last year I set out a list of my hilariously named New Beers Resolutions and as one notorious for both rarely making or rarely keeping resolutions I thought I would re-visit the list to see how I did or didn’t fare on my goals. Relax and enjoy the act of drinking craft beer i.e. take a break from diligent note taking and photographing in order to actually savour the experience. Actually I think I did pretty good with this one though those who know me will interject with the fact that I have become a little co-dependent with the Untapped app on my phone; however, I like to think I can now take a quick picture, write a few thoughts or just bestow a couple of stars and voila I am back on track to just enjoy the experience of savouring a great beer. I rarely carry around my rate beer notepad and I have taken to relying on my memory more than any physical proof that I really did try and enjoy any given beer. Learn more about the ‘craft’ aspect of craft beer. Hmm, this one is a little subjective but in the course of various blog posts I have done some further research into what constitutes a ‘craft’ beer or ‘craft’ brewery and while I cannot say with certainty that any hard and fast label will remain in perpetuity to distinguish craft from macro I like to think it will always be the beer drinkers who decide what truly represents the ‘craft’ aspect be it size, motivation, quality or a combination of many factors. Visit more of our local BC Breweries and tap houses. I did do this, in fact, I even spent a day at Steamworks Brewery assisting with their beer production. I also made a point of trying several new Washington and Oregon brewers anytime I was down in the States instead of simply re-visiting the places I know and love. Be discerning in my beer purchasing habits i.e. stop buying bottles with cool labels and start cultivating a means of selection. I like to think I am getting better at this but then along came my Pumpkin and Christmas Beer countdowns and all my bad habits re-surfaced with a vengeance i.e. funny beer names and creative labels became a de facto means of selection. Though I have to say I did my best to only splurge on beer styles I know and love, which means I have a little cache of Russian River sours and barrel aged stouts on hand for emergencies. Go to the Great American Beer Festival. Just didn’t do it so I am putting this back on the list and if I don’t make it to GABF I will got to the GCBF this year. Drink more beers on tap. In conjunction with my quest to try more tap houses I fulfilled this resolution with gusto. I am a big fan of draft beer often preferring what’s on tap to what’s in the bottle so this one wasn’t too hard for me. Get out of my comfort zone with home brewing. Not really but I do have another batch of ingredients ready to be made into a beer and I chose a random porter recipe to try so I think that kind of qualifies as meeting this resolution. To be honest, reflecting back on my decision to make this resolution I have to say I do not ever see me being a big home brewer, I really like to try different beer and the thought of being saddled with a lot of any one style is somewhat distressing. Become a certified beer judge (I see this as working in conjunction with resolution 1 since I would have a designated venue for critical drinking). Nope. I looked into becoming a beer judge and becoming a cicerone, both require a lot of work and commitment and I am uncertain about the degree of my desire to pursue either of these avenues. I think both certifications would be interesting challenges but at the end of the day I don’t see an immediate applicability to my workaday life, perhaps if someone in the industry wants to hire me I could consider beer judge or cicerone as career extensions. Make myself a beer calendar so I can keep on top of my inventory. Not really but I have been more on top of my inventory to ensure no lager gets left too long and no barley wine gets drunk too soon. Find additional ways to bake with craft beer. I did do this by incorporating pumpkin ale into a batch of chili, reducing golden ale with garlic and onion for an Irish stew and adding ice cream to stout for beer floats (not technically baking but creating nonetheless). Do more blogging (posting and reading) to get to know more people in this amazing family of craft beer enthusiasts. According to my handy dandy year end report from WordPress I really stepped up my game in terms of output last year increasing not only the number of posts but more importantly the numbers of both views and visitors for which I am eternally amazed and grateful. Help my cat cut back on his drinking problem… Well it’s been a tough haul for Merl but we finally got him switched over to hard liqour. Happy New Year to all my readers and I am looking forward to a 2013 filled with many great beers, great beer events and the company of great beer geeks! I do. I love them. Really and truly I do. True I enjoy a good stout as much as the next gal but sometimes I don’t want an entire meal in a glass and here is where the porter really steps up to the plate. Porters have many of the elements that make a great stout –roastiness, rich malt, creamy mouthfeel, bitter aftertaste– while retaining that amazing drinkability of a middle of the road ale. In honour of this (assumed mutual) admiration I thought I would devote an entire post to the wonder that is dark brown ale. First a little bit of a history lesson: Like many other well-known beer styles dark brown ales were being brewed in London for a generation before the term ‘porter’ was ever applied to them. In Tasting Beer Mosher suggests that far from being invented “porter emerged over a generation or more, transforming itself from an assemblage of brown ales into a pedigreed family of chestnut-colored brews that eventually came to named for the transport workers who were its most visible enthusiasts”. Porters are considered to be the first industrialized beers i.e. brewed and exported on an industrial scale. There has been a great deal of evolution in the style known as porter. Porters were first brewed from moderately kilned ‘brown’ malt. Then they were brewed more efficiently using the extract-rich pale malt but this meant the loss of the trademark appearance. Finally, burnt sugar was added to the process to re-capture that signature dark brown appearance; however, the addition of burnt sugar did more than just darken the beer it also changed the fundamental flavour. In 1817 Daniel Wheeler invented a roasting kiln for making black malt and once more ‘porter’ became an entirely different tasting beer. 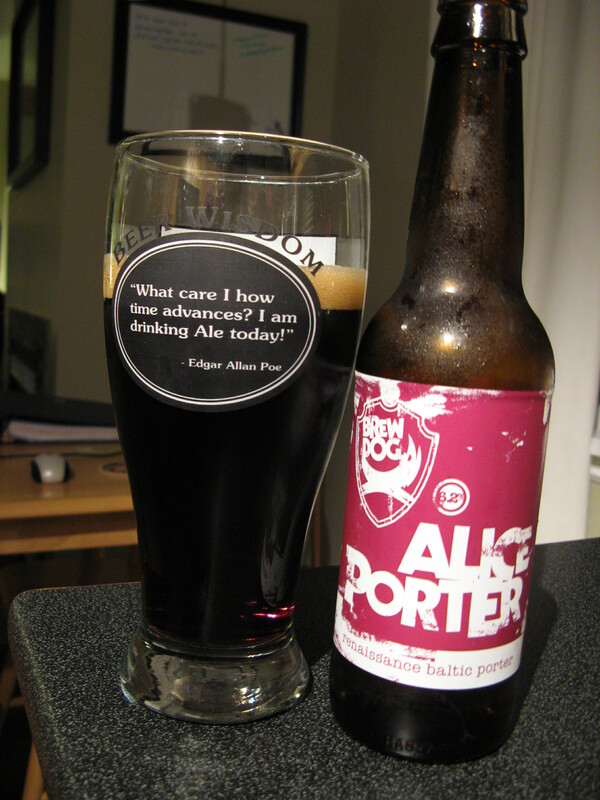 In addition to changing tastes there are different types of porter including Baltic Porter based on beers exported from England to Russian in the eighteenth century, Philadelphia Porters, which were famous for their quality and George Washington’s patronage, and German Porter had its day in the mid to late nineteenth century in response to the success of English porters. Sadly, the rising popularity of stouts did little to solidify the place of the porter in the beer pantheon, and when Guinness stopped production of it’s porter in 1974 the style seemed to be “officially dead”. Thirsty yet? One terrific example of the re-birth of the porter is Alice a renaissance Baltic porter from our eclectic friends at BrewDog. According to the brewers Alice is “decloaked and radically reinvisaged…a 6.2% sacred union of one 300-year-old recipe and two cross continental hop varieties. A delicate mirage of chocolate, red fruit and burnt sugar”. Alice is a very good girl. She is a deep clear brunette with a suitable amount of caramel head. The nose is an incredible mix of malt and burnt; like sweet bread that has been over toasted. 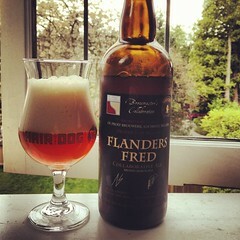 There is even a touch of sourness on the nose. Alice has a sticky almost chewy mouthfeel with a fig-like flavour that gives way to a slightly bitter aftertaste. The body is deceptive because the flavours trick your palate into thinking you are drinking a heavy dense beer but the low ABV makes it imminently drinkable. Excellent fall to winter beer. Last night I attended the second class in my home brewing course at the Vancouver Pastry School. We learned how to prime our beer (how to make our beer carbonated by adding sugar), we transferred our beer from the secondary (carboy) back to the primary (five gallon paint pail), and we got down to the business of bottling. As a group we swapped stories on our individual adventures in brewing. Luckily no one had any major catastrophes – at least none they were willing to fess up to. However, it seems we all had a tough time cooling our wort and managing our time so we weren’t brewing well into the morning. Temperature regulation was a bit of an issue since it is pretty difficult to maintain a constant temperature when the Vancouver weather is doing silly things. The bottling, though monotonous, is not too complicated and having a mini assembly line of classmates definitely sped things up. We all tried our hands at filling and capping and yet more sanitising. After our class brew was put to bed so to speak we got down to other beer geekiness such as learning about fermentation temperatures, how to get rid of head the sample in your hydrometer (just use an oily finger), beer judging criteria and using beer software to create our own home brew recipes. Look out world (and Russian River) I am making an IPA and a coffee stout. With respect to beer evaluation, we sampled two wit (white) beers (one home brew and one commercial) to explore the different facets of what makes a good beer. According to our instructor Adam, home brews are assessed using the Beer Judge Certification Program (BJCP) guidelines, which look at Aroma, Appearance, Flavour, Mouthfeel and Overall Impressions for each style of beer. This was an interesting exercise to do as a class because it really highlights the differences in people’s palates and the usefulness of having a standard by which to measure a beer. Left to our own devices there would be an unending list of tastes and smells that people perceive in their beers. Notably we all seemed to prefer the homebrew to the commercial beer. It seems like home brews have both a freshness and a subtlety that can be lacking in commercial brews – perhaps fear of ruining a batch lets the home brewer err on the side less is more when adding flavour elements or perhaps the smaller scale contributes to the difference. More tasting is required to be sure. Now back to the business or brewing: This morning I transferred my beer from the primary to the secondary. This step can be skipped but it contributes to the clarity when you siphon the beer off and leave the gunk in the bottom of your container. Hauling all the equipment around can be a bit of a challenge so make sure you intersperse your home brewing with trips to the gym, and if you have too much space and too much money get yourself a giant sink to bath all your brewing paraphernalia. I set my primary on the counter and the carboy on the floor to assist the laws of physics. I practiced siphoning with my sanitizer, which does not really taste that great despite being food safe. Then I got my beer going into the carboy and it was a beautiful thing; my brew had been hidden away in the primary for so long I had forgotten how lovely it looked. Transferring was quick and easy and I managed to avoid sucking up the spent yeast in the bottom of the pail. I had a little trouble getting my airlock to fit in the carboy, it seems to want to pop back out, but a heavy text book has taken care of the issue. The amount of beer looks good right around the top line on the carboy before it tapers. I liked this quick and easy step and here’s hoping bottling goes well …stay tuned.